Why are MRFs failing the contamination test? Better sorting leads to better recycled materials, leading to higher profit margins. It’s a simple and logical mantra that has been reiterated by the likes of Recycling Associ­ation chief executive Simon Ellin for some years. It has become a pressing concern, with China’s restrictions on waste imports having a dramatic impact on the UK. Thailand is the latest country to follow China’s example, after Malaysia, Vietnam and Taiwan. As a result, the UK Government has been forced to pay attention to the quality mantra. If it does not, we will be stuck with large amounts of material we cannot get rid of unless it goes to energy from waste or landfill. Investment has been made in some MRFs to meet the tighter demands of the Far East export market. But the latest WRAP data gath­ered under the MRF Code of Practice shows that a record percentage of material from MRFs in England of is no good. Figures for the first quarter of 2018 revealed that 9.6% of material sent to MRFs was non-recyclable, while a further 5.5% was recyclable but ‘non-target’ material. The code was first suggested by the Environ­mental Services Association in 2011 as a way of building confidence in the quality of material output. A mandatory MRF testing regime was devised and Defra also launched a Quality Action Plan in 2014. In the first few years of testing material, WRAP and the Environment Agency insisted that there was not yet enough evidence to draw any conclusions. But it is now clear that the action plan has failed. This must be a great disappointment to an industry that fought for the code’s imple­mentation. The issue has been raised in Parliament. At a meeting of the Environmental Audit Com­mittee in September, chair Mary Creagh grilled resources minister Theresa Coffey about data showing the contamination rate for plastics in 2017 was 9.5% and 8.2% for glass. “That’s getting worse over the past three years, not better,” Creagh said. The waste industry is unlikely to be impressed with this sort of soft pedalling. 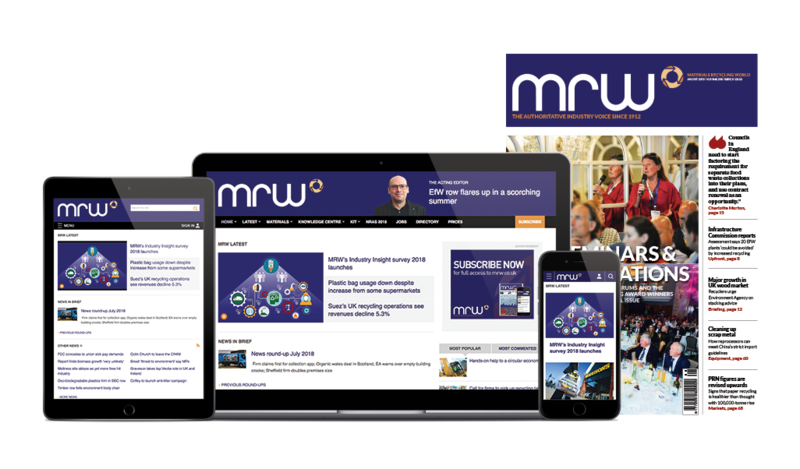 In the previous issue of MRW, UPM head of recov­ered paper sourcing and sales Simon Walker said he did not see the Code of Practice as hav­ing done much good. Victoria Hutchin, associ­ate waste and resource management consultant at professional services firm WYG, shares this view. Hutchin is clear that the only factor driving MRF investments has been market forces as a direct result of China, such as Biffa’s recent £4.6m investment at Edmonton and Viridor’s £3.7m investment at Crayford. “It only makes financial sense to invest in the infrastructure if it will lead to increased material income to offset this expenditure,” says Hutchin. “Largely, the UK’s MRFs are privately owned or at least privately run and, as a result, rely on commercial organisations that need to make a profit. Most organisations are not in the MRF industry for eco-credentials. “Landfill tax acted as fiscal incentive to do something better but the MRF code offers no such motivation for change. But what is behind the fall in MRF target material and what does the data really tell us? Is the low-quality output a result of low-quality input? The full picture is more complex. The input contamination rate at MRFs is actually at its lowest point at 84.9% – its highest point was 87.2%. “It is oversimplifying the matter to merely look at the relative proportions of contami­nants because different types of contamination cause more problems for outputs than others,” Huchin said. “For example, food waste contamination which, on sampling the inputs, could be con­tained. But once it has travelled through the MRF and its associated screens and conveyors, it may have spread over a much greater propor­tion of materials, thus having a far greater det­rimental impact on the quality of outputs than an initial assessment of inputs might suggest. Recoup’s 2018 UK Household Plastics Collection Survey showed a 3% increase in plastics packaging being collected but a widespread reported fall in quality. Concerns have been raised about the quality of collections. Data and opinions from the UK’s 361 councils were taken as part of the survey to examine the levels of collection of plastic for recycling. The survey, which covers the 2017 calendar year, showed that an estimated 527,010 tonnes of plastics packaging was collected for recycling from households last year. While the UK’s MRF infrastructure strug­gles to keep up with standards, even high-performing operators are worried what the future will bring. The re3 partnership, comprising three Berk­shire councils and FCC, recently announced it was able to send all collected plastics for reprocessing in the UK instead of exporting a proportion to China and Vietnam because of a “significant” investment in its MRF at Small­mead. Burt is also concerned about the impact of the resources and waste strategy, expected before the end of the year. “It is disappointing if MRF quality is falling. If the Government is genuinely intent on intro­ducing a deposit return scheme (DRS) for higher value materials, we will need to see how that will affect existing waste management infrastructure in the UK. Jakob Rindegren, recycling policy adviser for the Environmental Services Association, remains optimistic about the future develop­ment of UK MRFs despite sharing concerns on a DRS. “Clearly, technology is only getting better, and it will be interesting to see how quickly and at what scale some of the latest in automation and AI will be adopted,” he says. “End-market specifications will, if anything, get stricter, and increasing requirements on data capture and reporting is also likely to mean that MRFs have a positive future. Viridor invested £3.7m in enhanced paper purity and fire protection systems at its Crayford MRF in Kent. The facility receives 300,000 tonnes a year of commingled content from 28 local authorities. This is because, from 1 January 2018, sorted mixed paper was banned from import to China. But No 8 – a more refined paper grade with higher levels of news & pams than No 7 mixed paper – was still permitted into the country, subject to very strict quality criteria. Crayford produces around 140,000 tonnes a year of combined paper grades, of which nearly all has historically been marketed to China.